Brand affection is not only up to subtle marketing strategy, but far more often it is a result of more simple and immediate dynamics. Think, for example of all those products that we get to know and recognize in our childhood and then, almost unconsciously, we start to favour them in our everyday life. Our mother’s cream, our father’s favourite tie designer, or even the most simple details like the brand of pasta to cook for lunch or the TV channel where to watch the evening news. They’re positive coditionings that become part of our routine and almost never go away. Personally, one of the brands which fall fully within the scope of my family “heritage” is Julipet. It used to be and it is still my father’s favourite underwear and nightwear brand, and I can still remember when I was a child and I used to see him in the morning, wrapped in his pajamas or in his multi-coloured housecoats. And even today, after more than 20 years, I buy Julipet (this time for me) and I end up with my drawers full of their items. 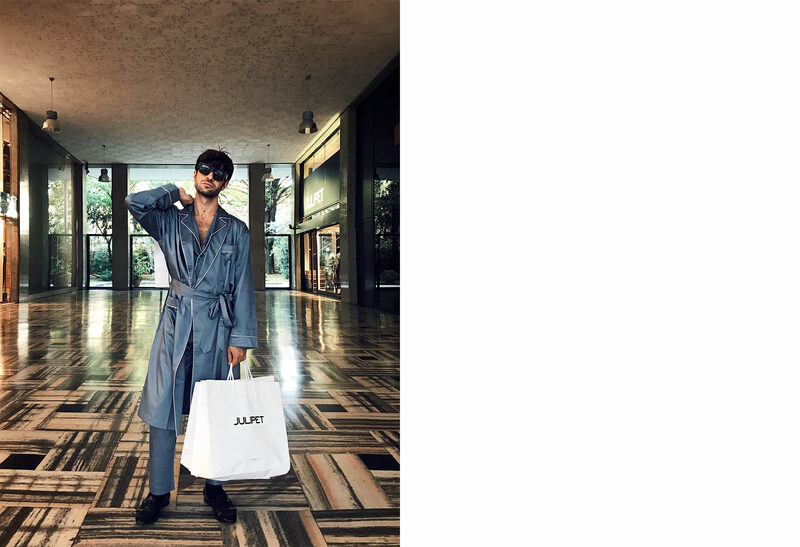 You can easily imagine how much I was delighted when I was invited to discover more closely this brand, and to visit the new Julipet boutique in Via Pietro Verri, 3 in Milan. Julipet is an italian company, founded in Bologna in 1954. A lot of people, myself included not so long ago, think that this brand has a French origin, therefore they tend to pronounce it as “Julipè” or something similar, but actually its name comes from the merging of the two founder’s sournames, Giuliani and Petazzoni, so it should be pronounced “Giulipet”, with final voiced T.
Since the strong italian style shines through the style and the choice of fabrics, but particularly through the attention to detail and the refined taste, it’s fair that the name reflects the DNA of the brand, too. After the extraordinary success of the ’80s/’90s, after various changes in 2013 the brand was taken over by Manifattura di Valduggia Spa, which already hold Ragno, with the aim of bringing it back to greatness, offering something that was comfortable and functional, but also with an accurate, elegant and refined touch, strongly connected with italian lifestyle, high quality and the search for natural and innovative materials. The Nightwear collection includes different items, from the most classical ones in cotton to more sophisticated suits in jersey or interlock. The great attention to the choice of materials, soft, performant and natural, reaches its greatest expression in J-wool, a wool pajama made in an extremely soft and compact fabric that has been designed to ensure great quality sleep, thanks to its extraordinary thermoregulation and transpiration properties. Material selection and a special care for wearability are essential elements when it comes to Underwear. The collection consists of a wide range of items, each of which has its own peculiarity and characteristics in order to meet the needs of a specific type of client. Pure cotton lovers, for example, can find the double knit fabric, an exclusive crown jewel of the brand, which combines compactness and brightness, or also the finest and silky lisle. If you prefer a more tight fitting you can choose the light cotton line, made in a extremely light stretch-cotton fibres that ensure a “second skin” comfort. The offer is enriched by classical boxers or modern boxers with inside- pants, a perfect combination between comfort and aesthetics. The brand’s aim to create a new lifestyle concept has lead to a new refined loungewear collection, that has been presented with their Fall Winter 17/18 season: its elements go from classical pajamas to the ones with a more multifunctional use. The watchword behind the collection is “comfort”, thanks to labels designed to be worn at home during your moments of peace, however their sophisticated style, which is palpable in wearability as well in their informal and relaxed looks, is ideal for outdoor usage, too. The Loungewear collection consist of a wide range of knitwear, sweatshirts and trouserscarefully designed to ensure extreme comfort and versatility. Along with men’s collection there’s a lovely “artist edition” collection for women, whose items have been designed in collaboration with famous international artists.